The NASA/ESA Hubble Space Telescope has captured a new image of Herbig-Haro 110, a geyser of hot gas flowing from a newborn star. 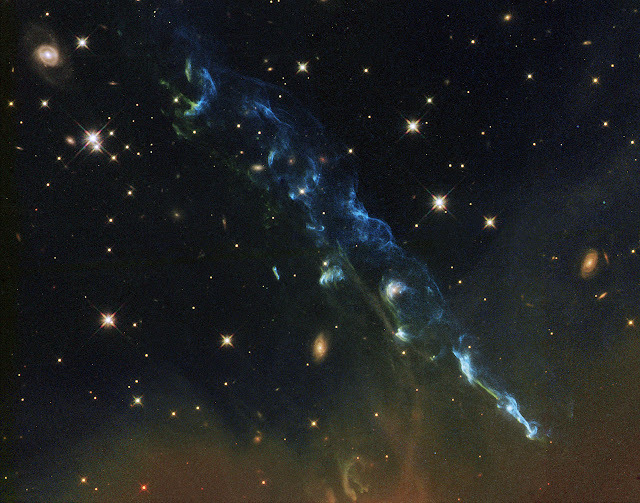 Herbig-Haro Objects are young stars that occasionally blast off hot gas and other material into space. This happens when the stars eject gas that collides with nearby clouds of gas and dusty at very high speeds. Herbig–Haro objects are generally found in star-forming regions, and several are often seen around a single star, aligned along its rotational axis. These objects are named after George Herbig and Guillermo Haro who first studied them in detail. The two astronomers (independent of each other) were studying star formations when they came upon the Herbig-Haro objects. They both recognized that these objects were a a by-product of the star formation process. The structure of HH 110 and other objects like it acts like a ticker-tape, recording the activity of the star that is the origin of the jet. Erratic outbursts from the star happen at times when more matter is falling in, and these are recorded as brighter knots or blobs within the Herbig-Haro object, which move along the jet over the years. Although the jets are very fast-moving, they are also very large: the streamer of gas in this image is around half a light-year in length. This means that the motion appears quite slow from our vantage point, even when measured over years (see heic1113).